Posted on December 3, 2012 by Warin	in AIDS, And the Band Played On, Denzel Washington, Hydeia Broadbent, Philadelphia, Tom Hanks. Yesterday, December 1st, was World AIDS Day. Since 1988 World AIDS Day has been recognized as a day to not only remember those who have passed from the disease, but also to acknowledge the more than 30 million people worldwide still fighting with it every day. The awareness of AIDS by individual people, communities, cities, nations and the global community, has come a long way since AIDS was first diagnosed in 1981. Looking back on media and newspaper articles from the late 80s and early 90s shows just how far we’ve come as a society in accepting people with the disease. That’s not to suggest that everyone thinks like this or that there is no longer a stigma associated with AIDS, but it is no longer as publicly denounced as it once was. Speaking of the public, it seems more and more organizations and entities are getting involved with recognizing World AIDS day every year. The red ribbons have seemingly become ubiquitous. Starbucks, Apple and even the National Basketball Association, have taken part in recent years in bringing awareness to the day. So too has the film and television industry with commercials and ads promoting the importance of getting tested. In 1993 two Hollywood films were among the first of their kind to not only delve into this still relatively unknown disease at the time, but also explore the evolving social impacts it was having as well. “And the Band Played On,” was a made for TV movie that dealt with the early years of AIDS and how doctors and scientists struggled initially to figure out where this disease that was suddenly killing people out of nowhere was coming from. The movie also depicted the battle of who would ultimately claim credit for “discovering” the disease. 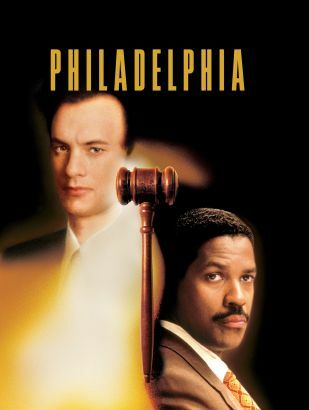 Another movie that year was “Philadelphia,” starring two of perhaps the greatest actors of their generation: Tom Hanks and Denzel Washington. Hanks portrays Andrew Beckett, a gay man who was working in a law firm and was on the rise until he contracted AIDS. Beckett was assigned the firm’s most important case, but was removed and subsequently fired once the lesions associated with AIDS began to appear on his face. Beckett hires Joe Miller (Washington) a man who is battling with his own discriminatory attitudes towards homosexuality, but agrees to take on the case anyway. One of the most memorable scenes in “Philadelphia” involves Beckett removing his shirt to show the lesions that led to his firing. Scenes such as these are not only touching, but moving. It also helps humanize Hanks’ character beyond just a man who lost his job due to AIDS, to a man who must now cope with having to deal with the cold shoulder of people he once considered his friends and co-workers. Recognition and awareness about HIV/AIDS is only the first step. We have to continue to make sure that the millions who are still suffering from this disease are not forgotten about and are able to get the necessary help and attention that they need. That’s why I applaud AIDS activist Hydeia Broadbent for the work that she continues to do in bringing awareness to AIDS and making sure that it remains a part of the national conversation. Stay safe everybody.